You’ve heard it a thousand times: “People are our greatest asset.” Well, talk is cheap. We believe that the core of our success isn’t our machinery, equipment or technology. Our 40+ year track record of success has been achieved because we hire the best people. We recruit and retain top talent because we know that our Team Members are our greatest asset. Our leadership in the industries we serve has been achieved because our people are the best. If you want to work in a fun, exciting and challenging work environment where your sense of accomplishment and reward comes from your commitment to your team, from open and honest communication, from mutual trust and respect, and from THRILLING our customers, then DuraTech is the right place for you to call work! 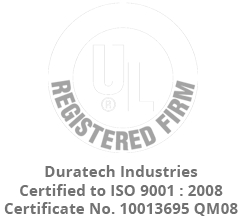 DuraTech provides an employee friendly environment and challenging work with a comprehensive salary and benefit package. All areas on the application form must be completed or your application may not be considered. If the answer to a question is not applicable then enter NA. Email completed resume to HR@duratech.com.